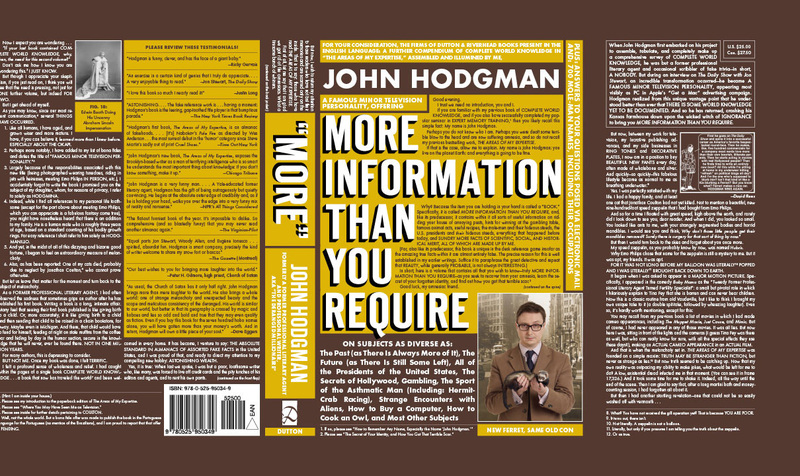 Boing Boing tv: John Hodgman, "More Information Than You Require." John Hodgman is known throughout galaxies far and wide for transcendent wit and bookish LOLs. You may know him from the Apple ads, the Daily Show hijinks, his blog, or his book, Areas of My Expertise (Amazon link), which begat the Internet Hobo Craze of The 21st Century. What you may not yet know about him is this: he has a new book coming out October 21, 2008, titled More Information Than You Require (Amazon link). The new compendium will include mole men. And, frankly, it's pretty sweet. We visited with him during a hotel hole-up at the Chateau Marmont, and interrupted his writing flow. He forgave us, and offered us a ham sandwich with some Soylent Green. Please to be watching. Link to Boing Boing tv post with downloadable MP4 file, and instructions on how to subscribe to the BBtv video podcast in Miro, iTunes, and other tools.